Dementia Care, Should A Caregiver be Truthful or Kind? 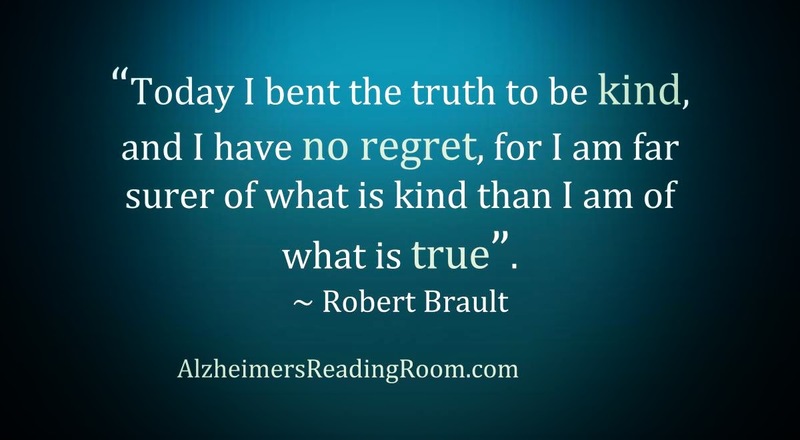 Alzheimer's care, is it more important to be truthful and cruel, or to be kind? I had an interesting and wonderful conversation with Susan Frederickson, the Caregiver Program Specialist, for the Area Agency on Aging of the Permian Basin (Midland, Texas). Susan is full of knowledge and has a deep understanding of Alzheimer's caregiver life. We talked about a long list of issues that Alzheimer's caregivers deal with each day, and as a result I decided to write about "Lies". About how difficult it can be when a person living with Alzheimer's asks a question that if answered "truthfully" is more likely to cause sadness, confusion, or might be met with challenging behavior. Is it more important to be truthful and cruel, or more important, to be kind? 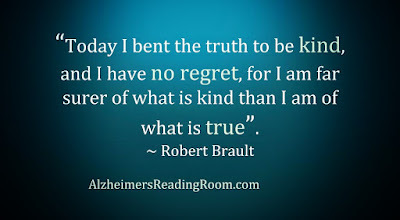 It is easy for me to understand why an Alzheimer's caregivers feels the need to tell the truth to someone living with Alzheimer's even if the truth can be hurtful. After all who wants to be known as a liar? Persons who lie are usually considered to be deceitful, untrustworthy, and are usually "looked down on". Most people pride themselves on being honest, and for being known to be honest. To tell the truth or be kind is an important issue in dementia care. How do you respond to mom when she is constantly asking for dad, a husband who has been dead for many years? Do you redirect the conversation? Or, do you give an honest, truthful answer? Sounds harsh doesn't it? Start by asking yourself this question - is caring for a person living with dementia about you? Or, is it about the person living with dementia? Whose feelings are more important? Imagine that you fell into a coma for several years. You woke up and you asked immediately for a person you love. And the response you received was, they are dead. The response was so unsettling that you immediately fell back into a coma. The next time you came out of a coma you asked again for the person you love. Once again you were told, they are dead. This happened over and over. I want you to imagine what you would feel like when you heard those words? And then imagine, you heard those words over and over, they are dead, but every time you heard, they are dead, it was if you were hearing those words for the first time. 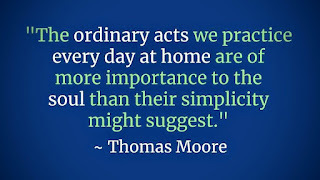 Each caregiver must decide, is the act of caring, about me, or is it about the person I am caring for? In order, to understand, cope, and communicate effectively with Dotty I had to start looking at each situation from her eyes. Once I was able to do this, I was able to make it to a new place. A place I call Alzheimer's World. In Alzheimer's World, the communication is about gaining the trust of the person for whom you are caring. Sometimes, this requires the caregiver to consider how something they feel they need to say might impact on the person living with Alzheimer's. Will your words make them feel sad, angry, confused, and cause them to start to withdraw from you and the world? Would you want to hear bad news over and over and over as if you were hearing it for the first time? Would this make you feel happy or sad? So for those of you that are grappling with this issue, is it appropriate to lie to a person living with Alzheimer's. I'll ask you this simple question? Is it more important to be truthful or kind? Kindness is a virtue. Cumulative acts of kindness make you feel good about yourself. How do you view a person who is kind? How do you view a person that is cruel? In Alzheimer's World the rules of communication are very different than they are in the "real world". No one is going to look down at you if you are kind, even if you have to "lie" in order to be kind. As a caregiver I had to step back. I started to pay attention to how my mom was thinking and feeling. I came to a certain realization - her reality was often very different than my view of reality. I accepted her reality. Soon the ordinary acts that she performed while living with Alzheimer's became understandable to me. Once I understood - I accepted them. They stopped driving me crazy. In fact, they became both normal and expected in Alzheimer's World. Along with acceptance came a lessening of stress. It was no longer about me. It was about my mom. Caring for someone who needs us so much, who relies on us so much is an act of kindness. 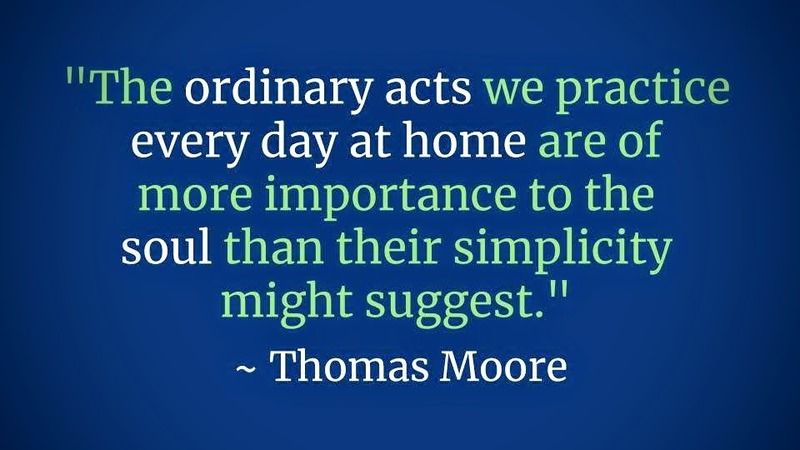 These acts which we perform each day allow us as caregivers to lead a meaningful and purposeful life.